Elite Capital & Co. Limited (“ECC”) has been entered into the list of the Top 20 Most Influential Companies 2017, in amongst a variety of top class firms. 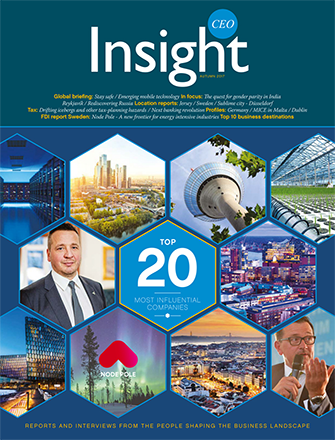 London, UK (AGENCIES) October 26, 2017 — Mr. George Matharu, President of Elite Capital & Co. Limited (ECC), announced today that the success of being in the CEO Insight Magazine’s “Top 20 Most Influential Companies 2017” was the result of enormous effort and teamwork within the company since it was founded in 2012. Elite Capital & Co. Limited (“ECC”) has been entered into the list of the Top 20 Most Influential Companies of 2017, in amongst a variety of top class firms. The inclusion of ECC was based on providing turnkey services for the engineering, procurement, construction and financing of major infrastructure projects. ECC has made strategic alliances with several organisations and companies, providing access to international markets in Asia, Africa, Middle East and GCC regions. This has given ECC a substantial foundation of clients to build on, and access to the markets that are most in need of the company’s products and services. In his statement, George Matharu (President and CEO of ECC), praised the support of Dr. Faisal Khazaal, Chairman of the Board of Directors, who has generated the business impetus for Elite Capital & Co. Limited since 2012; “Dr. Khazaal is responsible for the development of fruitful business strategies with customers on a local, international and governmental level, by using his relationships and influence that he has gained over time being the Chairman of the parent company Deals Secure Group Holding Company GP. (DSGH) since its founding in 1995”. The aim of ECC is to facilitate the commencement and completion of Infrastructure projects, stimulate economy, create employment and combat poverty. “Our services are suitable for all types of Infrastructure Projects in either Greenfield (Pre Operations Stage) or Brownfield (Operations Stage) including but not limited to Sea Ports, Airports, Railway, Bridges, Roads and Highways, Water and Sanitation Utilities, Energy, Communications, Hospitals, Schools and Social Infrastructure etc. This includes other projects or activities that impact positively on the relevant country’s basic infrastructure including the manufacturing of components used in infrastructure (such as cement and steel) and infrastructure associated with mining and agribusiness”, said Mr. George Matharu. Mr. George Matharu concluded his statement by saying “We thank all our clients and business partners who put their trust in us since the establishment of the company. I would also like to congratulate each of the 19 other companies who appeared on the Top 20 Most Influential Companies 2017 list”. This entry was tagged Award, ECC, Elite Capital, England, Finance, Financial, London, UK. Bookmark the permalink.